Microsoft Dynamics NAV 2009 RTC report design using RDLC has a lot of flexibility when formatting dates, times, and numbers. While you can create custom number formatting (which we will cover in a future blog post) many of the standard formatting options will often do the trick far more easily and without requiring the developer to worry about localization differences. For a full list of the formatting options, the MSDN site has a handy reference page for both numbers and dates/datetimes/times. I will not be covering all of the various formatting options in my example due to the fact that there are so many of them, but the most commonly used ones are represented. 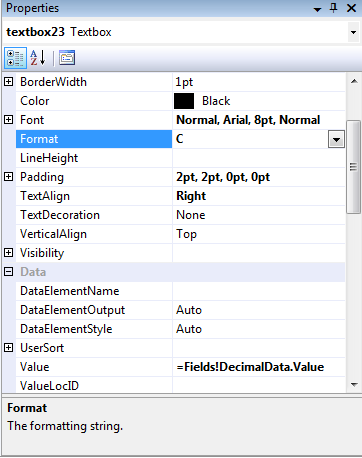 The RDLC formatting options typically will use your default localization info for formatting. If you are a USA developer working for a French client you may need to change your current locale in order to see the formatting options as your client will see them. One of the nice things about the standard formatting options vs. the custom formatting strings is that they will take care of this change for you without you having to write a lick of code and without you having to define multiple formatting strings for each locale you service. It bears mentioning that if you need to include multiple different locale formats in a single report there are some hoops to jump through to get that to work properly. We will cover that subject in a blog post very soon. Suffice it to say that it will not work to do multiple locales with just the standard formatting options. 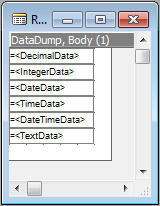 In the example above, I am formatting a decimal value to the locale default currency format (denoted by the “C”). Since I have my locale set to the USA, it will print in $#,###.00 format: Leading USD dollar sign, comma group separator, period decimal place designator and two decimal place precision. As I mentioned previously, if I send this report off to a French client I will not have to redo the report to print properly in Franc or Euro, the localized default format for currency will automatically handle that for me (Note: This does not convert the amount, only changes the format). See the attached sample report and PDF printout of the report that shows the most commonly used codes for more information.